The sacrament of Confirmation is a large and important step for young catholic adults further into God’s grace. With the support and help of their sponsors, they will receive the Holy Spirit and continue to live and thrive as a practicing patron. This is a milestone not only in the Catholic or Christian religions, but also for the young adult and sponsors. How do you celebrate this milestone and what is an appropriate Confirmation gift? A traditional symbol of the sacrament of Confirmation is a white dove, signifying rebirth and grace. As the Bishop is bestowing the Holy Spirit onto the individual with perfumed sacred oil, laying of the hands and prayer, a change is happening. Sponsors are responsible for guiding the changing young adult through life, leading by example and protecting and praying for them. The role of a sponsor is very similar to the role and functions of a God Parent during baptism and sometimes is the God Parent. 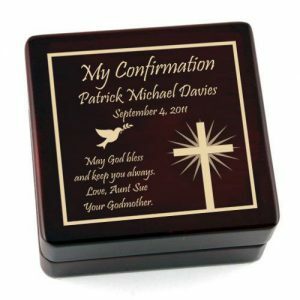 What is an Appropriate Confirmation Gift? Depending on how well you know the individual, a religious themed gift is usually the best gift. Stay away from personal gifts like perfume or clothing as this is a spiritual celebration. Jewelry for Women is also traditional, like a cross necklace or bracelet. Rosaries and Rosary Boxes make a great confirmation gift. Adorned with the symbol of a white dove and cross, engraved with the individuals name and special date of confirmation make this item special. What makes this item unique is the special message and words for encouragement from the sponsor or God Parent. Pair with a personalized or special rosary, this gift is sure to be used for prayer and reflection daily. Looking for a personalized rosary to match? Try The Rosary Garden for personalized rosaries with names, special color beads and icons. 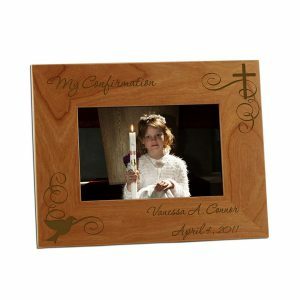 Help them to commemorate and remember the special day they were endowed with the Holy Spirit with a photo frame. Adorned with doves and crosses and engraved with the special date, this frame is sure to be displayed for years to come. 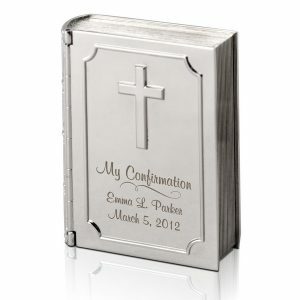 Add their special confirmation name to truly make it a thoughtful gift! 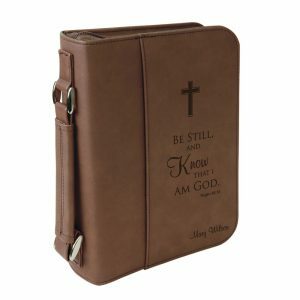 To help lead a life of prayer and forgiveness, a personalized bible cover can be a great gift. Help them keep their bible safe and clean with a special bible cover, with different sizes, colors and designs there is one for every style. 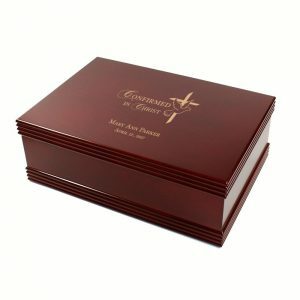 A personalized box, adorned with a cross and their name and special date is a great gift to keep small mementos like bibles, prayer cards and rosaries. Also this box is the perfect size to keep letters, cards and photos safe. No matter the gift, it really is the sentiment that matters. A new chapter is starting for the newly confirmed individual and it is a path of enlightenment and prayer. Help guide them on this new path with a thoughtful and useful gift. How do you celebrate this special sacrament? What do you think is an appropriate gift? Let us know, we love hearing your ideas and thoughts!